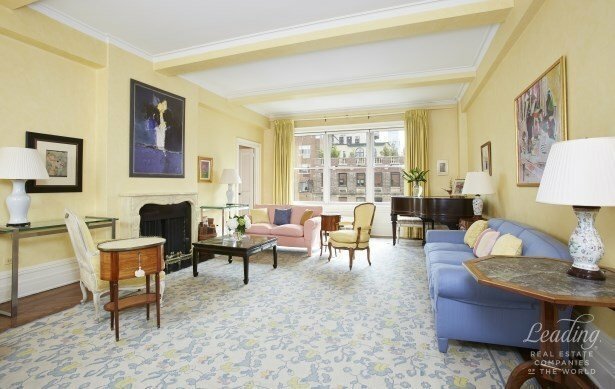 Perched high on the 14th floor of an elegant prewar cooperative on East 72nd Street between Park and Lexington Avenues, this gracious and sun flooded 10-room apartment boasts soaring 10' ceilings throughout, 20 oversized windows, original details including oak herringbone floors and beautiful moldings. The generous and classic layout is perfect for entertaining and everyday living.A semi-private elevator landing leads into the apartment's gracious 13' x 17'6" gallery, which flows into the grand South facing living room complete with a wood-burning fireplace and three oversized windows with open skyline views. Conveniently located to the left of the living room is the elegant 18' x 17' South facing dining room which also boasts open city views. Off of the dining room is the butler's pantry leading into a 25 foot eat-in windowed kitchen. The kitchen's breakfast area has open North views of neighboring townhouses and blue sky. Beyond the kitchen is a double-staff room with two East facing windows and a separate windowed laundry room. Between these rooms, there is a full windowed hall bathroom. This entire wing of the apartment is accessible off the gallery.There are four oversized bedrooms completing this residence. A private hallway off the gallery leads to three South facing bedrooms, each has ample closet space and they share a full windowed bathroom with vanity and tub/shower. Beyond these bedrooms is the enormous master suite, which has a spacious 14 x 24 bedroom illuminated by sunlight throughout the day and enjoys abundant storage with five ensuite closets and a north facing ensuite windowed bathroom. The oversized fourth bedroom is currently configured as a library, and an additional bathroom can easily be added to the west of this room.Built in 1917, this full-service cooperative is designed by architects Schwartz and Gross and is comprised of 60 apartments. Residents enjoy the highest level of service and privacy, including full time doorman, superintendent, gym, bike room, and storage. 50% financing is permitted. Maintenance includes electric. There is a 2% transfer fee payable to the cooperative paid by purchaser.